Two blogs ago, I was talking about getting back into my training rhythm and I knew that we still had a performance to do again, given we some weeks ago signed up for it. This week I was not to find my rhythm again, because this whole week was practicing for Jiangsu Mid-Year Local Performance. I have because of my drinking over a week ago had problems with my stomach, also because of all the trips I have been on lately. I haven´t given my stomach a food rhythm lately and properly also because I got some bad news in the beginning of this week. I applied months ago to get in to the university to study Physical education and health, and I didn´t get in, so as I tell my Blasian, I HAVE NO FUTURE. In my family our stomach usually takes all the blows from stress and bad news, so this week didn´t have the best beginning. I woke up Monday with low batteries, there was no energy whatsoever. I didn´t really sleep either so everything was working against me. 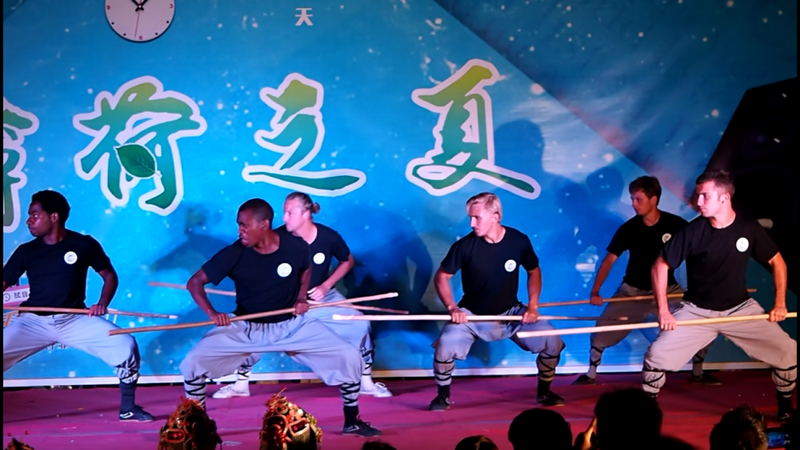 I thought okay my body is telling me to relax and I should I have done that obviously, but because of this performance, which is extremely important I had to go through it, because we apparently had to perform some sanda and us fighting with sticks. The next thing is, because if the low energy I can´t really go on my 10k no-stress runs, which I really need, so it is a big problem. Half the time I was dizzy and didn´t know where the hell I were, so I took caffeine pills, energy gels and drank energy drink to keep the batteries going. It was not a fun Monday and it was terribly long. It was the same thing Tuesday, and I must admit I don´t find the sticks that cool, I find them very boring and practicing something you really don´t wanna do, with no energy is extremely hard, I couldn´t get the speed I wanted, I couldn´t think straight and every time there was a position where we had to squat and get up again I got dizzy and couldn´t really see straight. .
And yes my as is almost showing on the picture. . . This is the thing, you are properly thinking, why not quit this performance, when you are obviously not fit to train? I know, I was thinking it myself a lot of times, and thinking –“I have performed so much anyway so I can sit this one out. There is a big BUT though and not the kind that Sirmixalot is rapping about. 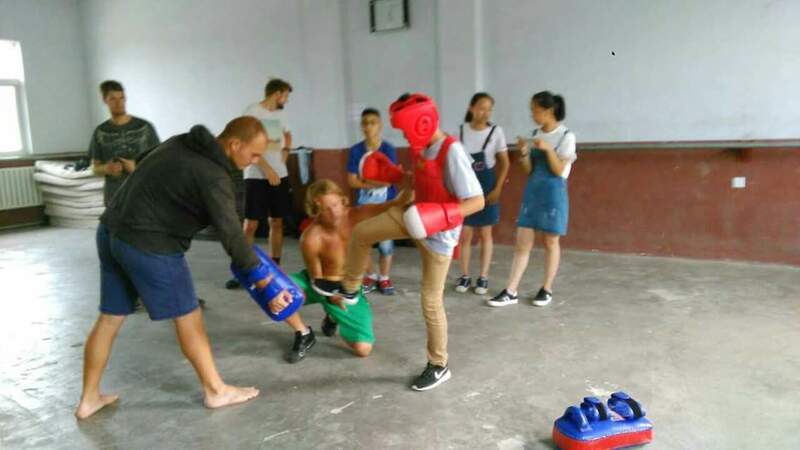 This performance is important, very important to master Bao and as always I wanna do everything I can for this school, and that means to keep up the spirit and use the energy I have on this and Saturday it will be over with a good performance. This is the thing here, at some point during your stay here, you will feel the batteries getting low and you awill have no energy to train. Sometimes it is the body who tells you to take a break and I always listen to my body, but other times it is just because you train so hard, so training here is not just about training, but finding a balance within yourself, and learn how to listen to your body, cause in kung fu the spirit and the power comes from within, if there is nothing inside, you have no power. Today it is Thursday and it is 30 plus degrees, my god the heat, but when master Wang said that the second class would be conditioning I saw my way to get a break and let my body rest, so I told master Wang that given my energy level I would sit this one out. When I was lying down getting ready to rest Master Do yelled and asked if I wanted to finish my crane form (flying crane fist), and given I also have a deadline for learning the forms I want, I had to say yes even though my body will punish me for it later. I have two and a half day of survival left and then next week it is time to really get back into a rhythm again. Obviously friday was not going to be fun, but I kind of had to go through it. we were told that the performance maybe would be moved, which it was. I put my body through hell for nothing. So here we are monday morning, my body is back and the energy is good, well as good as a body is a monday morning, so maybe not that good hehe. 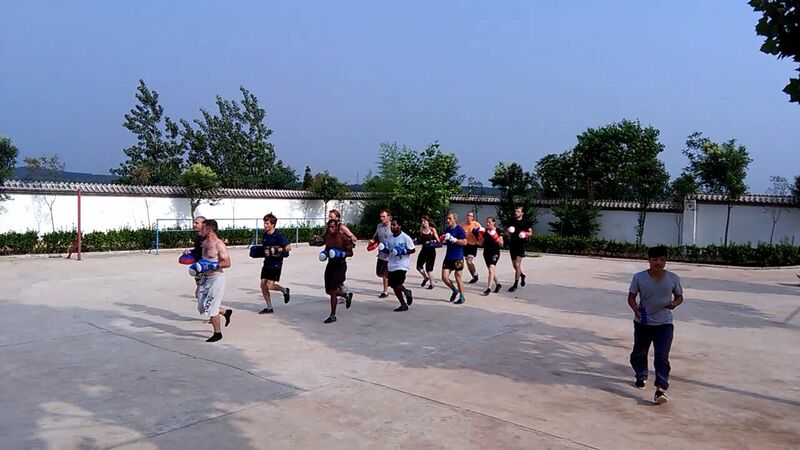 we know what to do, train for the performance, so off we go. . . 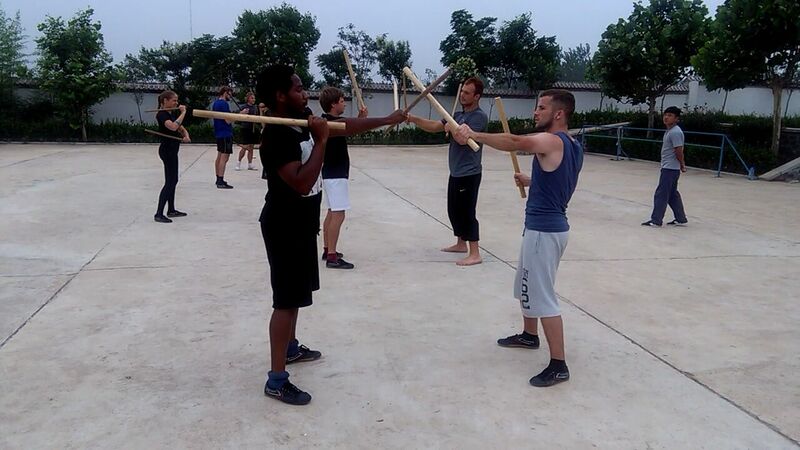 Stick form, fighting with sticks, staff group form, Sanda group thing. Friday : a whole week went by, where everyday should be the same, but sometimes we suddenly had regular training in between and it was just frustrating. Oh yeah did I tell you the performance was moved AGAIN!! now we had to perform Tuesday. so the monday before we had to perform, we were of course told, that we the performances were divided into three days. WHAT THE fudge, what just happened, another week with performance training. . .
We learn in kung fu, to always be ready, and I must say we are practicing being ready all the time, hehe, but it is all in good fun. So it became Tuesday, and there we were, on the way to Xinyi to perform, FINALLY. This say was groupform and Tai chi fan form day. First we did groupform, and then later Greg, Thiijs and Sabine did their tai chi fan form. It looked damn good. It became very late before we were home, so we knew that the week was going to be long. Wednesday morning, ready to train and in the middle of training to the next performance. There was Master Bao, and he said, we didn´t have to perform more this week, because he found our first performance to be to short, so the performance got moved AGAIN, to Tuesday. WHY you ask, well suddenly we have a continues fist in group form, Tai chi and the staff group form in one performance. BAM. It is frustrating, because when we are on stage, we want to feel good and comfortable, in what we are doing, and five days for practicing something new, was not in our plans. But we were given a life advice by master Bao: if you feel uncomfortable, then you just need to change that feeling. Hello, if I just knew that when my x girlfriend broke up, we would still be together hehe. her: I break up, cause it feels like we are more friends . . .
Me: yeah You just need to change that feeling! – so should we sleep here or at my place? we had some fun with that, but what I think happened was I slight communication problem between the languages. I like the advice though. So here I am Friday evening, watching game of thrones. . .
We been training the small things for use performance today and this afternoon I had a horrible 13k run. . I set out for 20+ but everything was against me, so as I said earlier, I listen to my body, so I went home, demotivated and annoyed. . . 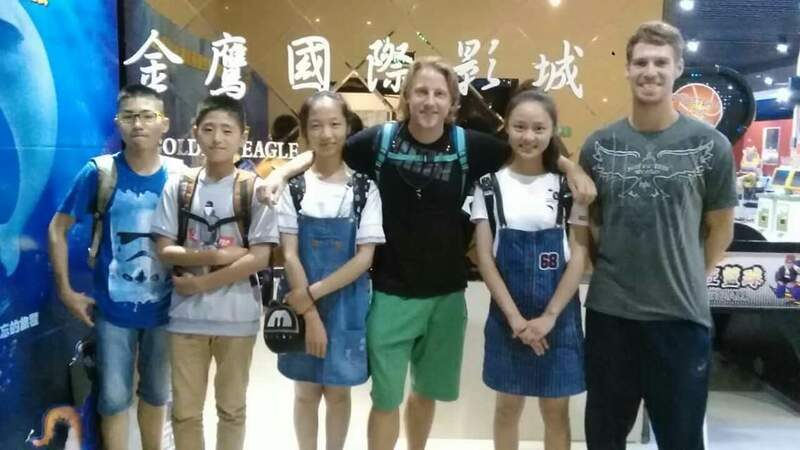 Tomorrow I will meet up with a few of the students Greg and I taught in huai’an and I will show them xinyi. That will be a good day. . . So here I am waking up, to meet my students. . It was a long day. . I devoted my whole day and evening for those four students who came to visit me. . I took them around xinyi and then back to the school to show where I live. Then we went back to xinyi to watch a movie. . Shane joined me so that was cool. .
That was a long blog. . Next blog will contain the Danes in shanghai. .